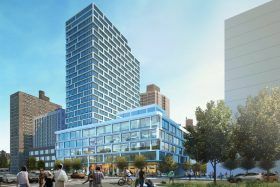 Construction of Handel Architects‘ mixed-use tower planned for the Lower East Side’s Essex Crossing development has officially begun. Located at 180 Broome Street, the tower sits at the Manhattan entrance to the Williamsburg Bridge, the structure which influenced the oversized concrete frames in the building’s design. The tower includes 263 apartments, retail at street level, office space on levels two through five and a section of the massive marketplace below ground, the Market Line. According to CityRealty, the start of construction at 180 Broome makes it the sixth site to begin building in the nine-site complex.